Come and enjoy autumn colour at our four RHS Gardens, with free entry on one day. Each year we offer the chance to come and enjoy the beauty of autumn colours at our RHS Gardens for free! Our beautiful gardens are open to all free of charge on one day. 2019 dates and details to be announced. Look out for the Equinox Borders, which opened in 2017 and are designed to peak in both autumn and spring. Asters are the stars of the show, along with autumn-flowering Kniphofia (red-hot poker), hardy fuchsias and Hesperantha (crimson flag lily). The Upper Tarn boasts fabulous autumn colour, and wonderful seasonal colour is also expected in the Woodland Garden. Despite the long, hot summer, Harlow Carr still saw some rainfall, which ensured that the trees there retained their leaves, so expect a stunning display. The Hilltop Garden and Woodland take on some particularly striking autumn hues at this time of the year. The Foliage Garden transforms as summer gives way to autumn, with the grasses taking on gold and red colours. In Lady Anne's Arboretum, underfoot the autumn crocus (colchicum) add extra colour among the rare and unusual trees. 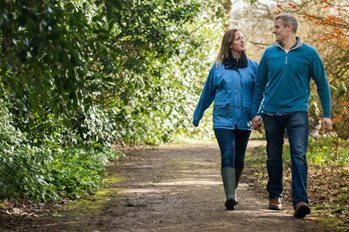 Visit RHS Gardens for free all year round by becoming a member. Discover how you can join the RHS today. There's always a great day out to be had at an RHS Garden, and autumn is no exception. Take a look at the upcoming events at each of our RHS gardens - from plant fairs and food festivals, to apple days and autumn workshops.